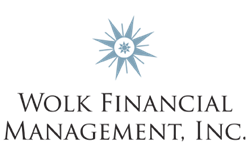 Established in July of 2006, Wolk Financial Management is a full-service financial management firm under the direction of Evan Wolk. Previously a Financial Advisor affiliated with Smith Barney, Evan believes that founding WFM better enabled him to provide his clients a high level of service while taking into account time constraints, risk tolerance and investment goals. Evan Wolk offers securities and advisory services through KMS Financial Services, Inc. KMS clears and custodies securities transactions through Pershing, LLC, a wholly-owned subsidiary of the Bank of New York. Wolk Financial Management offers a broad range of professional advisory services and products in all areas of the financial arena. To provide customized and investment management and financial planning for you, while helping you and your family reach your goals. To build long-term relationships based on a) trust, b) exceptional service and c) sound investment strategies. Selection of a financial advisor is an important decision, one that should not be taken lightly. This relationship is one which ideally is honest and long-term. Your financial advisor should understand your investment philosophy, risk tolerance, and financial background and should work to develop a plan to achieve your goals. Securities and advisory services offered, in states where licensed, exclusively through representatives of KMS Financial Services, Inc., Member FINRA & SIPC and an SEC Registered Investment Advisor. The registered representatives associated with this site may only discuss and/or transact securities business with residents of the following states: CA, CO, CT, FL, MA, NJ, NY, PA, TX, VA, WI. We are licensed to sell advisory services in CA, CT, FL, MA, NJ, NY, PA, TX, WI. We are insurance licensed in FL.